Edit your Maplist.txt, Mapcycle.txt and Votemaplist.txt Easly Ingame!! With the Map list Adder you can add/delete specified Map prefixes, All maps or only a Single Map. You can also set only ONE Map Prefix, e.g. 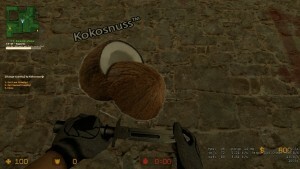 only de_ maps. See Picture! Simple script that allows admin to type !cm to change the map. 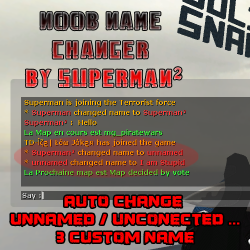 Auto Change Username like unnamed/empty/0 - Add 3 custome name ! Du kannst zwischen den Teams wechsel mit dem Chatbefehl "!team" oder zu Spectator wechsel mit "!spec"
Das Plugin zeigt euren Gesundheitsstatus Farbig an! The [Change-Gravity] Addon contains just two options. You can change your personal gravity between low and normal. This add-on proposes to modify all radio texts and sounds easily and quickly!